What a beautiful afternoon as Quinnipiac took on Saint Peter’s in the first game of a doubleheader. The Quinnipiac Bobcats entered today with a great attitude after yesterday’s win of 13-1. 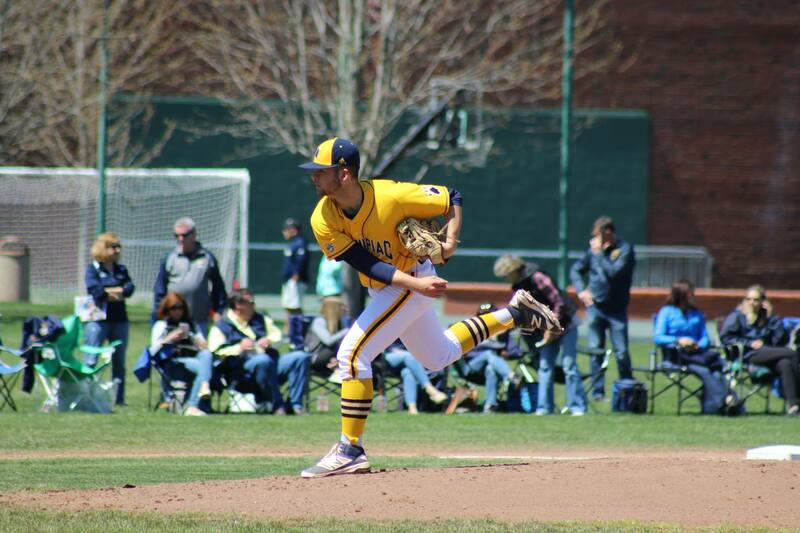 Quinnipiac defeated Saint Peter’s in game one of the doubleheader 5-1. The Bobcats are now 13-23 overall and 6-8 in the Metro Atlantic Athletic Conference, while the Peacocks are 0-22 overall and 0-11 in the conference. Junior Taylor Luciani pitched a great game for the Bobcats, going strong for all seven innings. He only allowed five hits with four strikeouts and one walk. He is now 2-5 overall with a 3.41 ERA. The first two innings for both teams were quick, with a couple of hits here and there. Liam Scarfariello started the hitting streak for the Bobcats with a double, but the Peacocks quickly turned a double play to end the bottom of the third. Saint Peter’s scored the first run after a leadoff walk, a bunt to move the base runner over and a blooper by Paul Schifilliti. That hit by Schifilliti brought in Cole Robbins of the Peacocks to take the lead 1-0. Quinnipiac quickly responded in the bottom of the third inning when Brian Moskey got a leadoff bunt followed by a stolen base from second to third. Mike Palladino of the Bobcats hit an RBI single to tie up the game 1-1 heading into the fourth inning. With the energy that continued to flow through the Bobcats veins, the fourth and fifth innings were full of hits. A double for Matthew Batten started off the fourth inning, followed by a walk. The runners were moved over to second and third from a bunt, but Scarfariello was then thrown out at home due to a bunt being hit too close to home. 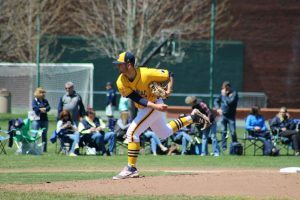 Quinnipiac led 2-1 against Saint Peter’s entering the fifth inning but the Peacocks struggled with getting hits against Luciani. The hitters continued to smash more doubles for the Bobcats as Anthony Cruz started off the inning with a double, followed by Palladino. Quinnipiac was up 3-1 with no outs when another double by Joseph Burns brought in Palladino from second base to give the Bobcats a 4-1 lead. An error for Saint Peter’s began the bottom of the sixth inning, which led to singles by Julius Saporito and Moskey. Bunts were what helped the Bobcats achieve the win today against the Peacocks and turned the game to 5-1. A strikeout for Luciani ended the game and secured the Bobcats to be 6-8 in MAAC conference. Quinnipiac plays the second game of the doubleheader against Saint Peter’s at 3 p.m., and will see if they can get closer to being .500 in the MAAC. The Bobcats will continue their season with a home game on Tuesday April 25 against the University of Hartford with the next MAAC conference games on April 29 and 30.